See our News' Page for Links to More News! Jerry Litton Family Memorial Foundation board members meet for an annual meeting in the Litton Agricultural Education Center on the campus of the Litton Agri-Science Learning Center in Chillicothe Thursday evening, April 6, 2017. The Jerry Litton Family Memorial Foundation was created in 1976 after the passing of Jerry, his wife, and their two children. 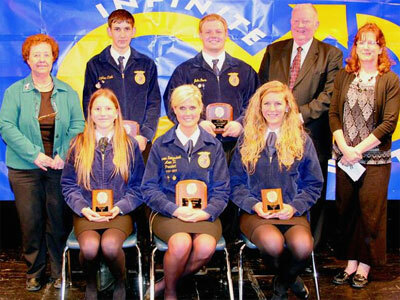 Over the years, the foundation has supported the development of future leaders in the agricultural industry and beyond. 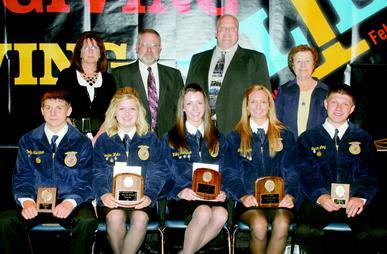 The CAFNR continues the foundation's mission through the Litton Leadership Scholars program. Other components of the endowment: the Litton Lectureship that brings interesting speakers to campus, the Litton Fellowship which supports faculty entrepreneurial activities, and the Litton Agricultural Leadership Fellowship to help students to gain farm policymaking experience. In April, 2009, the board held its first meeting after the death of the late Mildred Litton, co-founder of the foundation. (More on Mildred Litton) First established in 1976 by Charley and Mildred Litton, Mildred assumed the presidency of the organization after Charley's death in 1980. Upon her instructions, the foundation was to be reorganized by creating a five-member group of managing directors and up to 15 advisory directors. Members Hoover, Turner, Mitchell, Cohen, Chapman, Churchill, and Doughty were charter members of the organization. Other charter members were the late Pat Crabtree, Charlie Reed, Ken Harden, the late Oscar Cooke, and Clifford and Vivian Summerville. 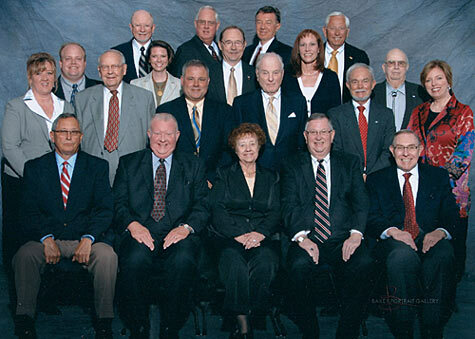 Jim Summerville joined the board in 1980 and E.L. Reed in 1996. The late Mary Ellen (Mrs. Joel) Valbracht served as director from 1981 until 2007. See archive photos below. 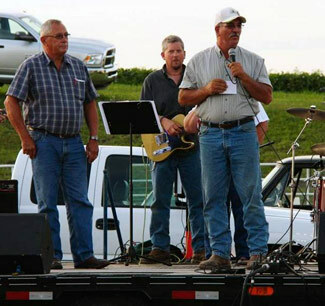 The foundation supports agricultural, educational, and athletic activities in memory of the Jerry Litton family. Primary focus is given to Chillicothe and Livingston County, but support may be provided to other qualified projects within the state. Each spring, the Litton Leadership Scholars program visits the Litton campus and meets with the Litton Foundation members. In the Fall of 2017, the Litton Foundation members will visit Columbia in conjunction with the Jerry Litton Lecture Series on October 3. The Jerry Litton Family Memorial Foundation may be reached at their permanent office at 409 Washington Street in Chillicothe, Missouri. The mailing address is P O Box 695, and the telephone number is 660-646-5050. The Jerry Litton Family Memorial Foundation is a private foundation established in honor of Jerry Litton, son of Charley and Mildred Litton, and his family, all of Chillicothe, Missouri. The Foundation’s Articles of Incorporation allow it to consider grant proposals for a broad range of projects and goals, but all grants made must be used for exclusively literary, educational and charitable purposes. You may download, view and/or print our complete guidelines and grant application here. Grant application forms may also be obtained by contacting the offices of the Jerry Litton Family Memorial Foundation, 409 Washington Street, P O Box 695, Chillicothe, Missouri, 64601. Grant applications may be submitted at any time. The Board meets periodically to consider applications. Grant applicants will receive notice of the decision of the Board. Grant applicants may be required to sign a Grant Award Agreement before receiving grant funds, and will generally be required to report the detailed expenditure of grant funds to the Foundation. SEDALIA, Mo. — Mildred Litton was inducted into the Missouri State Fair Hall of Fame on Sunday, August 16 in Sedalia. She was selected posthumously for induction into the Missouri State Fair 4-H Hall of Fame because she was instrumental to the success of many youth programs in Livingston County, according to state 4-H officials. 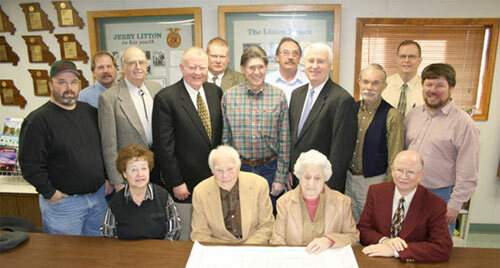 They also noted that Litton’s legacy continues today through the work of the Jerry Litton Family Memorial Foundation. Missouri 4-H recognizes outstanding individuals for their service and dedication to 4-H by honoring them with membership in the Missouri 4-H Hall of Fame. Each inductee is recognized and presented with a plaque at the Missouri State Fair. Fellow club members, families and friends of the inductees are invited to attend. 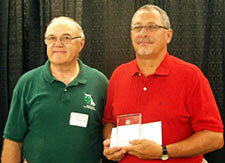 Ron Wolf, co-director of the Grand River Technical School, accepted the award on Litton's behalf. CAPTION: Mildred Litton was inducted posthumously into the Missouri State Fair 4-H Hall of Fame on Sunday in Sedalia. Ron Wolf, co-director of the Grand River Technical School, (right) accepted the award on her behalf during the ceremony. He stands with Bud Herzog, chairman of the 4-H foundation (left). 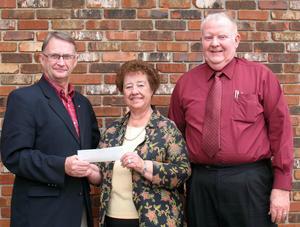 CAPTION: Steve Maxey, left, director of the North Central Missouri College Foundation, accepts a $10,000 gift from Bonnie Mitchell and Ed Turner, officers of the Jerry Litton Family Memorial Foundation. The funds are to be used for development of the Barton Farm Campus of North Central Missouri College. Click here for an ORDER FORM to order the Litton Dialogues' documentary and/or related DVDs and/or the published biography of Jerry Litton.